Tiger Woods achievements to date rank him among the most successful golfers of all time. Formerly the World No. 1, he was the highest-paid athlete in the world according to Forbes for several years. Woods has broken numerous golf records. He has been world number one for the most consecutive weeks and for the greatest total number of weeks of any other golfer. He has been awarded PGA Player of the Year a record ten times. 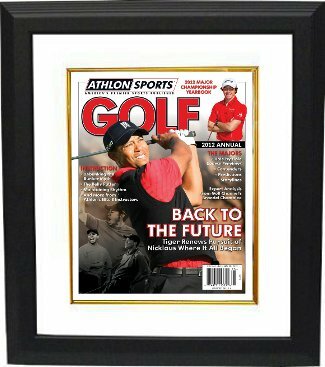 This is the 2012 Athlon Sports PGA Golf Preview Magazine Cover with Tiger Woods on the cover. Custom White Mat and Black Frame as shown.